There’s real pressure on parents of my generation to expose our kids to as many enrichment opportunities as possible so that they learn skills / stay occupied / keep up with other kids / get to do things we didn’t get to do. It sounds great to put your child in swimming lessons (life skill!) and soccer (team sport!) and violin or piano or dance classes (the arts! ), until you think about the potential costs of doing multiple activities each week: more time in the car; feeling rushed; less unstructured time and free play; parent stress from having to keep track of schedules and gear; and less money in the family budget for other things. Those potential costs can go up exponentially if you have more than one child. I was looking for—and got—validation that it’s okay to not try to do everything when I read Simplicity Parenting: Using the Extraordinary Power of Less to Raise Calmer, Happier, and More Secure Kids by Kim John Payne. What to get the six year old who has everything? You can do what I did, which is make your best attempt to find a gift that is inexpensive but also interesting and interactive and aligned with a reported interest in princesses, then watch that gift (with a lovely card made by the birthday girl’s friend) get added to a pyramid of like packages because about a dozen children were invited to the party and no one arrived empty handed. No one left empty handed either, because sometime between my childhood and now it became a common American middle-class practice for each guest to leave a birthday party with a gift bag of candy and plastic trinkets. As I plan my son’s upcoming birthday party, my husband and I have agreed to put “no gifts, please” on invitations and to not provide gift bags. There will be cake and classic six-year-old party games adapted to an outer space theme based on my son’s current interests. I will say now that the work and craftiness required to pull that off—on a small budget, by amateurs—has me predicting a special outing with family or a friend next year instead of a party. If you’re looking for some useful suggestions and encouragement on how to simplify your child’s birthday party and keep the emphasis on fun, check out birthdays without pressure. Back in August I committed to doing back to school clothes shopping at a consignment store or Goodwill. You can see above what I picked up for $47.50 on two trips to a local consignment store. The child already had enough jeans, t-shirts, socks, and underwear, plus a pair of tennis shoes, a light jacket, a couple of hats, and mittens that fit. 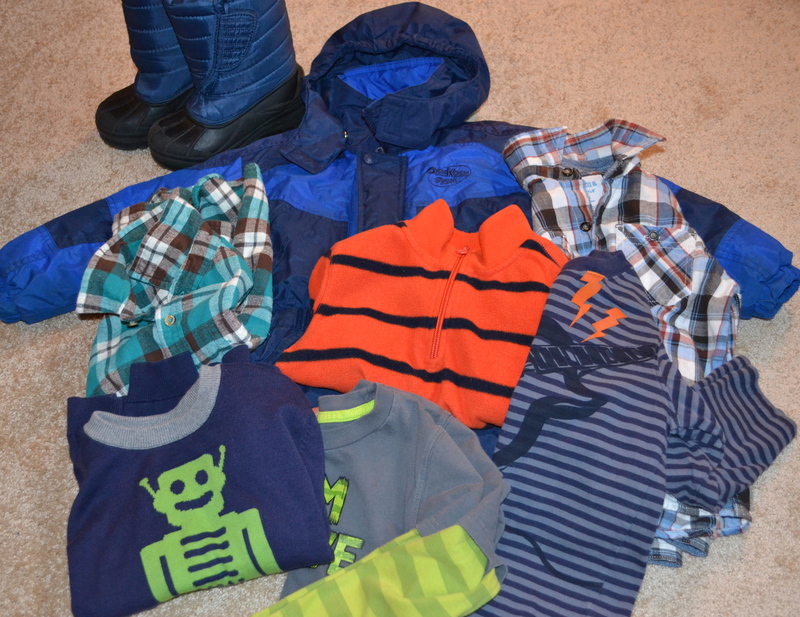 Aside from snow pants and winter pajamas, I may be done shopping for him until the weather warms (May) or he grows significantly. If you don’t live near a good consignment store or if you are comfortable shopping online, check out thredUP, which buys and sells kids, juniors, and women’s consignment quality clothing. You can search with all the filters you’d expect on a good clothing site, like category, size, price, and color, and you can zoom in on thumbnails. I haven’t tried it yet, but a friend of mine vouches for it. Shopping at Salvation Army/Goodwill/DAV/St. Vincent de Paul can require additional techniques. A Goodwill clerk broke it down for me: there are senior days and tag days when shoppers can get serious discounts. People who know the system show up early on the most advantageous days and buy up the best stuff. This is probably not a system that will work for me. I believe that we are all better off when men and women become parents because they choose to. For today’s parents (especially mothers), there’s a constant cultural message that we need to invest more in our children. This year the baby-product industry is worth an estimated $49 billion. It’s useful to be reminded that embedded in cultural influences are industries invested in you and me having children and continuing to grow as consumers. “Before there was a mommy industry, before there was product to move, you’d never hear how it was the hardest job in the world,” says a New Yorker interviewed for the Time article who develops e-commerce sites targeting mothers but chooses not to become a mother herself. “If it’s the hardest job in the world, I’m damn happy I don’t have to do it,” she adds, sounding just the way you think a saucy New Yorker should. In a world with too many people, especially too many resource-depleting rich people (fellow Americans), we should be glad that some men and women prefer not to add to the population and support them in making a decision they feel is right for their lives. Then those of us who already have or want children can focus our attention on managing outside influences that in some cases are less about doing what’s best for our children and more about consuming in ways designed to make us think we are. At our house we’re just getting ready for the start of kindergarten, so the well of back-to-school experience isn’t exactly deep. Here goes anyway. Our day care/preschool situation is such that we have years of experience packing lunches. Reusable containers like zippered cloth bags with plastic lining are convenient and have cut our use of disposable plastic bags to almost nothing. I wash the cloth bags inside out with a load of clothes every few days and lay them on the stove grates to dry overnight. In my research on how to do school supply shopping, I saw recommendations such as “watch the ads like a hawk” and “stock up when you see rock-bottom prices.” Here’s my opinion: if you’re already planning to shop at a big box or discount retailer, the money you might save on a loss-leader like pencils is not enough to make up for the time you spend watching ads or making a special trip to the store. I also disagree with stockpiling unless you know from experience that this makes sense for your family. Want to know my good fortune? We were able to order a school supply kit in May through a vendor set up by the school’s PTA (liking those other parents already!). The kit will be delivered to the school and includes student supplies for the year along with classroom contributions such as hand soap and a box of tissues. And each kit sold raises $20 for the PTA to do more good work. When I caught on that my son wears the same things over and over again—and that his core wardrobe does not include that salmon-colored hipster shirt I know would look so cute on him—I stopped buying as many items of clothing. A wise friend also says that getting her children dressed in the morning is easier when there are fewer choices. So my challenge with back to school clothes shopping is this: resist the temptation to shop at the Gap and see if I can satisfy my own image needs (they are my needs) with trips to a children’s consignment store and Goodwill, where I have made many donations but never shopped. What suggestions do you have for keeping back-to-school time simple?